Michael Kahn: So, I’m going to do this little interview with you to talk about Benedick. Christopher Plummer: Oh, I hope I can be entertaining. MK: Well you’re a famous Benedick. How many times have you done it? CP: Twice. One in England [at the Royal Shakespeare Company, in 1961] and one in Stratford, Canada [at the Stratford Shakespeare Festival, in 1958]. CP: Yes. I think that is about right. I mean, even some of the critics noticed it. You remember old Henry Hughes? CP: He was one of the ones that said, at last he’s found his own, you know… he’s his own master now. MK: What was it about the role that freed you up in that way? CP: It was Eileen Herlie [a Stratford company member], actually, who made such a wonderful Beatrice. She suggested this kind of landed gentry farm girl, she was strong and sophisticated. The director, Michael Langham, had set the production in Ruritania, a kind of Austro-Hungarian period, in which—rather like Kenneth Branagh’s movie—it was a landed gentry farm, the county seat to which all the soldiers came back after the war. It was a lovely way of setting the play. It wasn’t ultra sophisticated and it had an earthy quality that was particularly good for Beatrice. I think it was because Eileen came on with such sort of smoke and fire and brimstone, that I decided to underplay Benedick. Not in the first scene, because that has to be a wonderful shouting match, but later on, Benedick changes. And I suddenly realized that I didn’t have to work so bloody hard, I could just go with the text. Because he has a wonderful arc. He tries to keep on this conceited line of thought, and then he learns as he goes along, and he’s made human. She makes him human by picking out and showing him his shortcomings all through the piece. So, by the time he’s sympathetic towards her, it’s just before the wedding scene and he just changes completely. I don’t know, it’s as if Shakespeare suddenly wrote a movie. The intimacy and simplicity and economy of Benedick’s responses in that scene are just so modern and so unbelievably now that I just went with it. And I found that Larry [Sir Laurence Olivier] and Ralph [Sir Ralph Richardson] and all those people who I had been influenced by so much in the past weren’t necessary anymore. I found my own way of coming on and just obeying the language, which had to be obeyed, at least in terms of making it sound contemporary and real. I learned a hell of a lot from Benedick. CP: They had met, as far as I’m concerned, but we didn’t really have much time to talk about that, we just barreled in and did it. Michael [Langham], I think, was influenced by Chekhov. It was part of this country society. It was Chekhovian in feeling. MK: The country house and servants, eating out under the trees. CP: Right. I thought that was lovely. MK: What would you say to two actors who are playing Beatrice and Benedick? What would you say are the wonders of the play, and are there any pitfalls there? MK: And more mature in everything. CP: And Benedick really just wants to go out and commit suicide, I mean, it’s just awful. And suddenly, like I learned, he’s got to change, he’s got to suddenly be the most real person on that stage, and the most vulnerable. And then they come back and they flash at each other but it doesn’t work anymore. And she recognizes it and feels great sympathy and loves him. Loves him. MK: That’s lovely. We just went into rehearsal. Much Ado director Ethan McSweeny was doing Dangerous Liaisons up at Stratford while you were Prospero in The Tempest. CP: Oh, he’s so good! MK: Yeah, he’s doing Much Ado, and we started rehearsal today. I’ll let Ethan listen to this because he’s very curious. CP: I think Ethan is just fantastic. MK: You know, he was an apprentice here, I’ve known him since he was 17. CP: Oh, I didn’t realize. MK: Oh yes, he started out as my intern, before he went to college. CP: He survived even you! 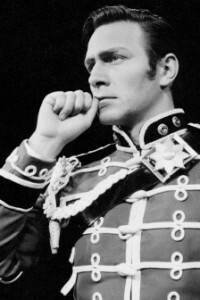 Perhaps the greatest Shakespearean actor born in North America during the 20th century, Christopher Plummer is equally comfortable on stages in London, Broadway and his native Canada. He has been nominated for the Tony Award an outstanding seven times, in six different decades, and won twice. He has also been nominated for an Academy Award and won two Emmys. He was honored by the Shakespeare Theatre Company in 1990, when he received the William Shakespeare Award for Classical Theatre.